Disclosure: Links in post contain affiliate links while still offering you great, low Amazon prices. Is your pooch or other pet ready for Halloween? 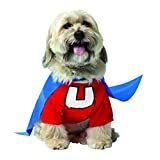 If not, you may want to Shop Best-Selling Pet Halloween Costumes at Amazon. Seriously, who can resist Underdog? They have a ton of great costumes--take a look for yourself!